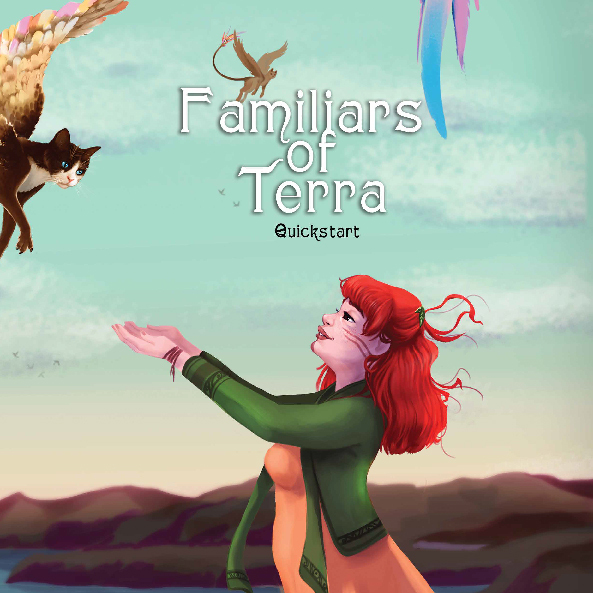 I don’t often suggest Kickstarters on my blog but I want to point to one that’s wrapping up in the next couple of days: Familiars of Terra. This game comes from Liz Chaipraditkul (designer of Witch). Liz also oversaw Heroes & Villains and The Crescent Empire for 7th Sea 2e. I’ve reviewed the former and I’m running some fantastic sessions using the latter right now. 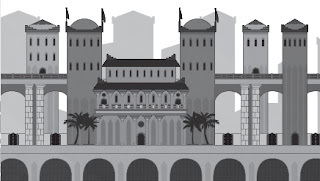 The Crescent Empire’s hands down my favorite Middle Eastern-themed rpg supplement: smart, respectful, showcasing diverse cultures, and filled with imaginative space. You can hear my interview about her 7th Sea work here. The concept feels like Digimon meets Lgend of Korra. At least that’s the vibe the Quickstart suggests. That’s how I ran it for our online one-shot. Like the best settings and supplements it has hooks as well as room to find your own space. Sherri and I love how the system handles the familiars—everyone has them (ala The Golden Compass), but those of the PCs develop and grow. Add to that a strange magical-techno post-apocalypse and I’m hooked. I’m really looking forward to the final product. It is funded and they’re looking at stretch goals right now. The interior art’s awesome too. I highly recommend it. If you’re interested you can check out the session I ran. I had a great time—and the players loved it to. You can also check out the Quick Start on Drivethru if you want to see what it’s like. Several years ago I ran demo scenarios for Eden Studios games at conVentions. 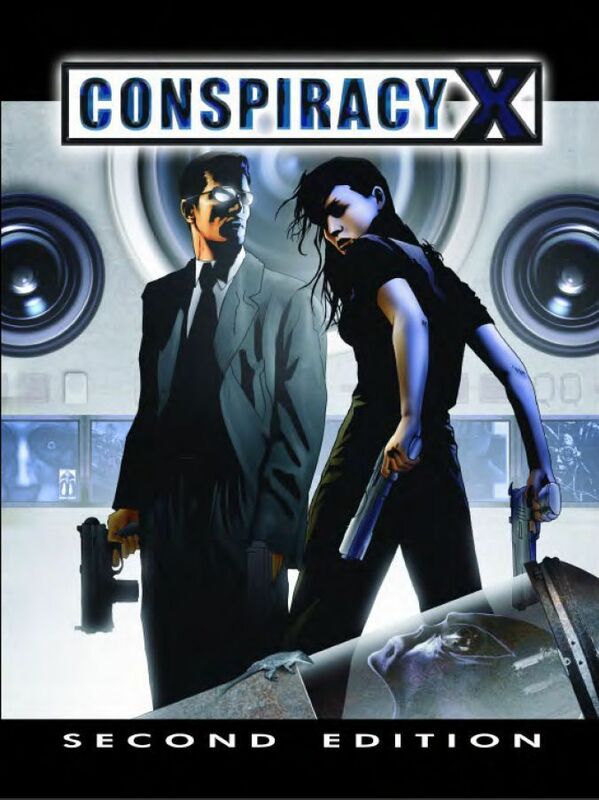 I put together my own stories for Armageddon, All Flesh Must Be Eaten, City of Heroes, and Conspiracy X. I actually have an project I submitted ten years ago that's been under contract with them for three years. 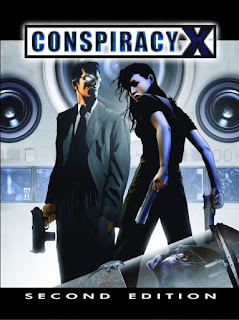 In any case I've been hunting around and found my notes for my 2004 ConX adventure. They're not complete, but you could easily use them as inspiration for a Monster of the Week scenario. I present this in its rough, unedited form. Characters are members of a “Clean Up” Team. They follow up on the work of an actual Field team. In some ways, their job is more difficult. Generally they are given a set of tasks to work from. These can range from discrete to more difficult. They are given a lot of leeway in how they handle things. If the situation is complex or requires finesse, usually a member of the Cell which carried out the operation will remain to brief them on what needs to be done. The set up for this is that they will be given a discrete set of three tasks in advance of their going in to the situation. The area will also be described as one where there is potential for enemy interdiction, though you may want to downplay this particular aspect. Task #1: disposal and elimination of firefight and location; Task #2: Checking on possible witness to earlier events; Task #3: Sifting through materials at closed location for further evidence, preparation for storage and transport; Task #4: General survey of locality to make sure grumbling is at a minimum…any irritation should be general rather than specific. Smallish town but not so small that they seem entirely out of place. Allow them to make their way around the city. My thought, drawn from my experience in Ken’s game is that their contact should be out of it. They will want to keep this quiet. What they were doing here? What do we need to do to clean things up? Are more of the team left? How can this be contained? Remember that one of the central points to this should be that the characters have to maintain their cover very carefully. Breaking character too much could result in creating further problems. Meet up with contact; dead in hotel room. Brings up preliminary problem: leave body or clean it up. Either case creates certain problems. I don’t know if this works with the scenario/threat I’m imagining, but an abandoned facility. Government property. Site of a relocation facility. Worn out. Good many of the locals tied by blood to those who were brought here and locked up. This could be a site for background research, a location for investigation or a hide out. One member of the team having lost it. This being based on what they’ve encountered and his own paradigm on contagion and transmittal. What is he planning in the meantime? Has he lost it really bad? Is he just out in the woods or will he try to destroy the town? Again, echoing Ken, the source of the contagion could be a book. Someone carefully making copies…either printing them or something else. Perhaps printing the outlines and then filling those in. Sending them out randomly as packages across the country. Perhaps that guy is left or perhaps one of the other members of the team has been taken. Both should be dangerous and wrong. Possibility of a showdown between the two of them. Ideally this should be done with a timeline of what is going to happen. They may be able to divert or lessen the craziness that is going on. Look over my CoCth notes for scenarios. See if anything there has promise or could work in a 4 hour setting. Perhaps there are details which could be reused. One of the ideas being, especially if it is a book or an object, that it could have been found on eBay or else be being sold there. This would allow them to use their respective skills to hack to find out the identity of the seller and the buyer. I could use this to lead them to a more substantive investigation. The lead in from the previous investigation is the most important thing to consider. What did group one come in to investigate and what did they miss? If we know that, then we can start to consider what we can put in front of the them to serve as clues. At some point, there needs to be a combat. I shouldn’t be the thing that solves the problem, unless they’ve come to that naturally through the path of investigation. This combat should involve most of the group. Include a couple of opportunities of quick, abstract combats with some risk to them…if not actually dying, then perhaps a serious injury or something that will impair them. They probably have medical equipment in the car, but they will have to drag themselves over there. This, in itself, could be a problem or a trial. In the late 1930’s, a U.S. team off the coast of Massachusetts apparently dropped depth charges, destroyed a number of shoreline facilities and finally raided a small unnamed town. A number of the residents were killed, some incarcerated and further numbers shipped to an internment camp far inland. They were held based on their immigration status as well as with some question of their subversive activities. Many of them died over the next several years, with their bodies being quietly disposed of. In 1944 however, funding for this covert project vanished and those people who had been assigned to guard the few remaining locals were reassigned to East Coast POW camps. The center ended up becoming a kind of shanty town. Eventually a few of the older children were placed in local schools. While they suffered badly, eventually there was a movement for them to either move away, or make a place in the community. By the 1960’s only one family still lived in the internment center. As a covert project, the land ownership rights had been hidden for some time. While locals, including the local government tried to purchase chucks of the property, it fell under a Military/EPA listing. This had been the default for this land. As a result, many regard it as free land. There is a fence built around the area, but most people can get around this easily. There are a number of squatters who live on the property, hunters who make this a regular walk through and also people who dump in the area. Several months ago, a local, Derek Rivard, decided to hunt around in the old internment property. His hope was to find something interesting to sell on eBay. He has a fairly weak antiques business that he runs out of this home. While digging around, sweating pouring off of him, his body shaking from the exertion, he uncovered a book. It apparently had been hand made, with pages and paper made from pulp magazine and comics which had been pressed together and bleached, sheets of cereal box cardboard formed the covers. Floss and thread held it together and it had been covered with some kind of faux leather. The interior pages had some strange writing, a mixture of languages, all in the standard alphabet, but with symbols. The ink was faded in places but in others, had simply become blackened. He took this home, gave it one round to sell on eBay, but that failed miserably since it had no pedigree. Some of the other stuff he found did sell. Rivard looked at the book and began to be infected. He placed the book with his other old books, slowly causing the ones closest to be transformed. Then somebody came to buy, Mitchell “Mitch” Seigelson. They purchased another book from him. Perhaps a repair book for a particular car model. He got it home and read the book, becoming infected. He bought a computer and started ordering stuff off the internet, odd stuff. Since he lived a ways out of town, he was able to conceal most of this. However, he also needed victims to power what he was doing. It was this combination of strange purchases which suggested someone mucking around with bad stuff combined with a string of disappearances that brought the previous team to town. They were to locate this person, ascertain his level of knowledge and eliminate any kind of threat he posed. This is the person that they traced down. They did some preliminary investigation, but had a pretty good idea of what was going on. The Cell team, a four person group, closed in on Seigelson. Unfortunately, this resulted in a firefight, with the result that MS was killed pretty early. The team leader called in a cleaning team, told two of the group to straighten things up at the house and get it prepped. He put his surveillance guy near there and headed back to town to wait for the call from the team so they could leave. In the meantime, while investigating the house, and after having seen the body, the CDC person, Danafer, comes across the book. He is infected, sending him off-balance. He realizes that this book can transmute and infect other books. At this point he goes nutter. He kills the other evidence specialist on site, then goes out to kill the guy in the van. This he drives to a pond nearby and sinks. Then he heads into town to finish off the Cell leader. The book is a kind of corrupting memetic disease, turning each person into a separate and demented version of this Demon. It incarnates depending on what the Vices and Sins are of the person involved. So, for example, Mitch had his own fetishistic drives. These were deepened by the possession. To change other books mimetically, it needs a lot of books around. Isolated and on its own, it takes a long time to infect. However, each of these “memetic beings (I need a better name for them) is independent from the other. As a result, this may cause strife and/or hostility between their various forms. Question remains: what other activities are going on in the town that the group can come across. The other time thing is that Danafer may be calling in an unpleasant Op to clear this place. This can serve as the other break point for the game. Either the base Guy will manage to scan and post a version of the book or else Danafer will call down high holy burning hell on this place, including the PCs. Mind you, Danafer is infected and crazy. Therefore he will not be open to rational discussions of whether or not something has been cleaned or not cleaned. He understands everything in terms of contagion. Six Characters. Note: I used a tarot generation mechanic for the personalities. I’ve written before about one of my favorite urban supplements, The Kaiin Player’s Guide. 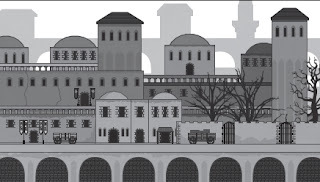 It’s a player-facing resource for The Dying Earth RPG covering the titular city. Kaiin’s a hefty book detailing locations, people, and secrets, but it’s not for the GM. Instead the players may peruse it at their leisure. Eschewing ambiguity, the book clearly lays out problems. Players declare they want to get tangled up in a particular story. That’s a useful approach for the fiction-first mechanics of Blades in the Dark. I’ve created a player-side resource not for Doskvol, but for U’duasha, an alternate campaign locale from the BitD Special Edition. This Iruvian city offers new atmosphere, color, and supernatural elements. I hope John Harper will eventually release a pdf of the Iruvian text for those who didn’t buy the special edition. Johnstone Metzger’s done an amazing set of Iruvian playbooks and those now have a Roll20 version. It would be great to have more players experience this material. I’ve provided six hooks/rumors for each of the five neighborhoods of U’duasha. Some of this will only make sense if you’ve seen the full Iruvian appendix. But I hope a good deal of it could be useful for Blades in the Dark generally. The district of miners, laborers, and craftspersons. 1. Nozar Tabasi, a respected tapestry maker, has been searching for his lost brother, Uktannu. However he’s unaware that family Anserekh killed and placed Uktannu’s soul in a Hull to preserve and exploit his mining expertise. Tabasi will undoubtedly pay well for those who can find (and possibly free) his brother. On the other hand, Makru Anserekh would like this nosy busybody to go away before others, such as his philanthropic sister Ishana, learn of his operations. 2. The I‘Rajin gang has a formal hierarchy built on contracts and connections. Their wealth and power make others wary of crossing them. But sometimes the gang’s internal disputes spill out into the open. Leader Saru Daava has been more agitated and reckless in recent months after one of her gang’s internal ledgers went missing. She has searched desperately and punished several of her enforcers. Currently she suspects the Vizier Akhita the Fair took the book, but has no proof and no idea where it went. That’s good news for the freelance Mirage Ozutok Sabanci who currently has the volume. He doesn’t quite understand its importance, but believes he should be able to sell it on for some coin. Depending on where it ends up, heads could roll. 3. The fixer and marriage broker Mete Balcan is much loved throughout the district. He can be found drinking in a tea house, wandering the market, or gambling in a back room. 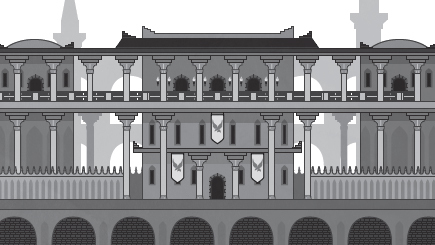 But Balcan’s façade hides a dangerous agent of the Empire. He covers his tracks well and few suspect him. He often hires scoundrels for strange tasks to indirectly gain information. His generosity to those who serve him well is renowned. However some serve him unwillingly, like the assessment clerk Tirgataô. He would love destroy the evidence the fixer uses to keep him in line and extricate himself from Balcan’s grip. 4. Long-time Rail Jack Nikou Kamran has a fairly encyclopedic knowledge of the comings and goings of various trains. She’s often seen at the station talking with younger Jacks or signing up for a short journey. She keeps a particular eye out for interesting shipments, especially those which people want kept quiet. Nikou knows there’s a shipment of valuable spices heading out from House Anixis, bearing saffron-like azayzl and vault pepper. Kamran knows the terrain along the routes and the necessary stopping points for deliveries, watering, and sidetracking from other trains. 5. 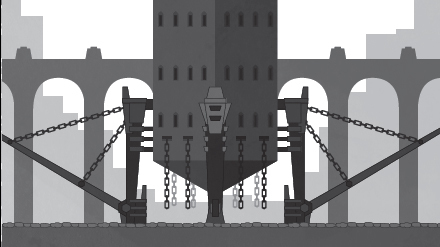 Those who have suffered injustice often go to the district’s Khuset Spire to beseech at the Demon Prince of Justice. However of late, owl-masked vigilantes have been taking matters into their own hands here. The locals have a whispered system to ask for aid, pinning a message onto an owl in a particular place. The vigilantes are local merchants who have secretly banded together. They could need aid or be blackmailed. On the other hand, the I’Rajin would pay well for information on the group. 6. Some among the A’Tahim bristle at the gang’s focus on stability and protection. They would like to push further into an all-out war. Nozar the Welder works to undermine this approach. He’s among those overseeing Betu’at neighborhoods, protecting local citizens from other criminal gangs. He’s been pushing for confrontations and working behind the scenes stirring up trouble between gangs. In some cases he’s hired outsiders to hit places. Nozar believes that if an all-out war erupts, the A’Tahim can seize control. He has several gang members under his influence who don’t exactly understand his intent. Nozar works to keep this project from his own leadership as well as his rivals. He has aid in the form of an I’Yalim officer who would like blood to wash the streets, Hunter Arman Radan. 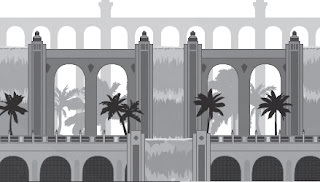 The district of parks, theaters, and high culture. 1. People have sought the treasures of Mazaiyar the Guiltless for years. The master thief pilfered from the nobility while maintaining a respectable façade. When he passed, his associates rushed to raid his vaults for wealth and incriminating information. However they found nothing. The scavenger Sênêkas has a new lead. Mazaiyar apparently had a fascination with opera and may have concealed his loot in the Circle of Hearts, an aged theater. There some question whether theater manager Asatira Baastani knows of these matters, perhaps drawing on those resources herself. Currently the theater is in the midst of a long-running performance of “The Shah of Blackvale.” Actors and staff live on the premises making a search difficult. 2. Like the rest of the world, darkness dominates Iruvia. But alchemists and botanists have developed plants which can survive and thrive, fed in other ways. There’s a strong industry in carefully tended flowers and herbs. They’re processed and converted into perfumes and scented oils for sale here and in other nations, sometimes mixed with Leviathan ambergris. Darya Zangane of the Falling Petals Market in particular uses unsavory methods to obtain cuttings, seeds, and whole plants from collectors in U’duasha and beyond. She’s made enemies in the process, especially Gemeti Anserekh who suspects her of stealing a rare rose from his secure greenhouse. 3. Those who wish to have an event recorded for posterity turn to the many faceted Guild of Painters in U’duasha. Like the city, the guild splits into four traditions, reflecting different styles and approaches. Painters use a reed-derived paper, carefully prepared and reinforced to last. Nobles expect treaties, agreements, large-scale contracts, marriage arrangements, and the like to be recorded in a painting. These serve as a history, though not an unchanging one as artists may be hired to “correct” an earlier image. Currently two traditions of painter families, Daqiq and Wahuma, vie for leadership of the art world. They jealously guard techniques and secrets. Hossein Daqiq presently rages about an amazing blue tint used by Omid Wahuma. Omid makes his remarkable paint from secret fungus gathered in the deepest vaults of the city’s underground reservoirs. 4. Plays and performances held in licensed theaters must gain approval from The Conclave. Such permission is usually granted by Seeker Abbas Eshtiaq without much trouble, provided those requesting have a good reputation, able patrons, or enough ready cash. When complaints come in from those above, Eshtiaq’s quick to revoke approval. In the last year, The UnCutting Blade, a group of disgruntled artists and performers have been putting on underground shows. These satirize the nobility, the Conclave, and the rule of the four demons. Eshtiaq has been trying to hunt down these performances, while the troupe’s leader, Rukhsana, has been trying to undercut and expose the Seeker. 5. The House of Dreams and the House of Majesties were once a single restaurant, the House of Majestic Dreams. However when the owner-chef died, he left two competing heirs: Poriya Vaansh, a master of classical dishes and Bawan Roşan, an experimenter who integrates foreign techniques. The two have been locked in a battle for over a decade, since the original restaurant burned down mysteriously. They steal each others’ staff, hijack ingredients, disparage recipes, and even engage in sabotage from time to time. In particular they battle to serve parties at the houses of the nobility. 6. Some consider Iruvian bees the great survivors of the cataclysm, perhaps thriving even more than humanity. The size of a thumb, these bees pollinate scattered plants and somehow continue to produce wax and honey. Killing a bee’s considered bad luck and a hive infestation can force a family to move out. Jahanabad Kamran, the Grand Apiculturist of Emberthorn Park takes special pride in the floral and wondrous products from his hives. However recently new honeys and striking waxes have made their way onto the market. The Forger Xartamos wants his identity and process kept secret: using specially-made Hulls as intelligent, mobile hives of ghost bees. The golden district of the wealthy. 1. The Counting Lodge is both a tea house and place to play “Baaz Yafiri,” the Game of Deaths. This abstract board game has an ancient tradition, devotees, and respected masters. However a recent series of games between masters Kurigalzu and Azita Riahi has come to a halt split 3-3. The former has vanished for reasons only known to him. The latter is relieved because she has been pressured by the A’Tahim to lose the final game. However with nothing settled in the match, bettors and enthusiasts have been driven to a frenzy. 2. River sailors who wish to partake in the delights of U’duasha have two choices: settle for the sketchy, violent entertainments of the River Lock warehouses or travel through Sukru’at to reach sections of the city with higher, but not too high class pleasures. Seneschal Mahdi Shajarian has seen an opportunity here. When his master, the reclusive Mehram the Corpulent, died he hid this fact. Mahdi has been quietly running affairs of the household. He’s turned the secluded estate into a house of pleasures. Using a network of servants, maids, and butlers from other houses, he provides discreet services for river captains and their crew. It’s a small operation, but a risky one. Shajarian has recruited a group he’s more than willing to cut loose if he can make a decent score. 3. Master Rajan, spy-master for the house of Anixis, looks to uncover the secrets behind the spectacular lanterns recently displayed by House Ankhayat. Long lasting, bright, and multicolored, these have become a point of pride for Eshala, the expected heir to the house’s fortunes. He has not sold any of these, preferring instead to display them conspicuously at gatherings. His artisan, Ajkuna of Thrask, accompanied him back from Tycheros. She has remained on the estate grounds since then, but has been looking for new materials. 4. Access to the Asha’va river locks offers lucrative trade for who can seize it. Though nominally outcast, The Forsaken gang have the tightest grip on that. That’s given them control over most water-based smuggling. But gang leader Torek has become angered as reports of other goods being smuggled in reach his ear. He has told his allies in the Dockers to keep an eye out the perpetrators. Unknown to him, a city surveyor named Burnaburiash discovered a series of underground tunnels leading to the river. He’s enlisted his cousin Ku-Baba, an inspector and assessor in his scheme. She makes sure certain packages vanish from the books and get left in the right place for Burnaburiash’s agents to pick up. 5. Two generations ago, House Anixis split as a brother and sister contended for control. The victor, Matriarch Pegah, still lives and pulls strings behind the scenes. However some resent her control and others worry about the number of buried bodies. A small group arranged to smuggle in Sevder Ferhat, the only surviving child of Bawan’s brother. Sevder has spent the last decades in Doskvol, building up a network of agents and informants. More importantly he has acquired a number of artifacts associated with the Demon Prince Ixis. He’s accompanied by a Mitra Aslani, an Iruvian in the pay of the Empire and a former agent of Elstera Avrathi, House Anixis’ diplomat to Doskvol. 6. Far and away the most common bird in U’duasha is the owl. These come in all shapes, sizes and species. Other birds don’t survive well against these predators. It is why the falcon serves as a symbol of status for the highest of the I’Yalim investigators. The House of Merciful Fletchers, run by Reza Safavi, sells unusual birds. He pays top dollar for new birds and the eggs of birds “borrowed” from collectors in the city. Safavi has heard of a bird of unusual plumage which has taken roost in one of the machine works near The Well, but has been unable to obtain it since the workers regard it as a good luck charm. The district of schools and training halls. 1. Students of several schools of swordplay, including Serpent Alighting and the Falling Star, have been killed in recent months. They have been caught out in the evening and engaged in duels by Şeyda Behram, illegitimate daughter of Scholar Najra. She has mastered a corrupt style and secretly trains herself to kill her father. Several schools would like to discover who has slaughtered their students, while Behram herself would like to catch Najra in an ambush. But Erfan Mahmoodi of the Rising Moon school has noted the strange wounds on the victims and is looking into how someone learned such an unusual style. 2. The Vaasu School provides education…to those who can afford it. Some actually study and learn there while other spoiled elites coast through to please their families. But a few run up against the limits of scholarship, moving into the realms of speculation and heresy. Some have turned to the Zindiq Sulili. This revolutionary firebrand teaches them forbidden arts laced with political commentary. He moves from house to house, salon to salon, always one step ahead of the authorities. He’s sought by Hunter Deemethresu of the I’Yalim, but the Gualim avoid him. He claims to know secret way to dismiss and fool the black-clad enforcers. In fact while Sulili possesses mystical powers, he’s something of a charlatan, using the trappings of subversion to raise his rates. 3. Lacking strong central institutions, social power is key in Iruvia. The four houses struggle over loyalty, influence, and reputation. They command society. However from time to time a member of the nobility will commit a reprehensible act in public, a transgression with witnesses which cannot be hidden away. In this case the fallen noble may seek redemption by supporting or establishing a Lodge of Charity. These lodges provide loud and visible charitable acts in their patron’s name. Nazanin sul-Kian has become a widely sought expert in establishing these Lodges. She knows how to stage for effect, have clients demonstrate believable penance, and hire reliable actors. More importantly she’s also good at funneling charitable monies back to a noble’s family, allowing them to appear extravagant in their generosity. Some, especially members of the Hadrakin, resent her corrupt work. Nazanin herself continues to look for new avenues to generate money using these Lodges. 4. Student Roya Mahdavi has developed a new and unbreakable cypher. A break-in led her to believe that the Ankhayat want to steal her work. She has gone underground, becoming politically active in a group called the Shadow of ar-Rafiyyah. They use strange graffiti encoded with her cypher to pass messages. Imperial agents and Enlil-nasir, second to Captain Hayansa of Anixis, have been seeking Mahdavi and her knowledge. 5. Siyabend Kardux of the Vaasu school has been slowly and carefully insinuating himself into the operations of the school’s archeological institute. While not a scholar, Kardux masters logistics, scheduling, and recruitment. As a result he knows where excavations take place, what they’re bringing back, and who has been hired to work. He’s looking for a reasonable partner, trying to avoid the scrutiny of the Hadrakin, who usually consider such areas under their auspices. Kardux also hopes to avoid the attention of cultists or the Unburned. 6. U’duasha doesn’t share Doskvol’s culture of broadsheets and daily journalism. Instead they have storytellers and pamphleteers. The latter travels throughout the city providing daily news and information at the tea houses in exchange for tips. Such storytellers have circles of associates, complete with streetrunners. The former craft longer, more in-depth pieces—bound volumes detailing their researches and reports. These authors write under pen names and their exposes can bring down notables. One such author, Apsu the Green, has gone missing. He had been investigating corruption and vanished monies involving the military and the current Warlord. Captain Nassim Hematti grabbed up Apsu, but is uncertain what to do with him. She’s tortured him for his sources, but so far the writer has given up nothing, hinting that if he dies he has allies who will publish his notes. The city center which burns with eternal arcane fire. Home of the poor, the zealots, and the great steam machines of the city. 1. Cultists serving the Forsaken Gods have recently set up Spirit Nets to catch ghosts before they fall into The Well. The frighteningly sane zealot Atrus al Atrus collects these in a forgotten tomb near the heart of the city. He hopes to use these as power for binding other forces and perhaps to destroy the Hulls used by the mining companies. Atefeh Manesh, a Zindiq, has tried to pursue this, but her warning have been turned aside by Ekurzakir, a senior member of the A’Tahim and secret ally to Atrus. 2. The heat and power of The Well is turned to many purposes. 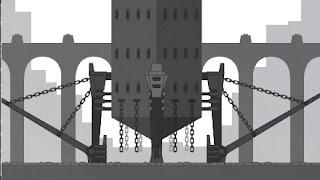 At “night” it powers forges, great steam engines, punch & form machines, and material cutters. During the day the lifting of the barriers creates a wave of heat. It is a crushing task to manage. Unlike the Miners, these workers have no union. Lezgîn Ararat of The Forsaken exploits this, and materials which slip between the cracks come to him. There are those, such as Red Mot, who would like to unionize or at the very least pitch people like Ararat into the Well. 3. A new and potent beverage has appeared on the streets of U’Duasha-- A’tiraq-- a scarlet liquor of surpassing intoxication despite tasting like burning. Many have sought out who created and distributes this in hopes of obtaining the secret. The Rakshasa Mansahet intends to keep this under his control. By aging a cheap brew in specially treated barrels near the light and heat of the Well, he’s imbued the drink with power. Currently he uses a loose conglomeration of street thieves and fellow ghouls to move his product. He knows eventually he’ll have to face The Forsaken, but he doesn’t realize how intently the Gualim search for him since the drink echoes their biding techniques. 4. The Weedwall Souk is an occasional black market run amidst the twisted brambles of the Blackwood. It is said that anything can be had here for a price. Occultists and arcane practitioners frequent the place looking for rare substances. The Souk is overseen by Ozdemur, a masked figure who secretly represents the Unburnt. The market master is in fact a carefully crafted and statuesque Hull who escaped from the Aserekh. That knowledge would upset Arezoo Raeisi, a Rafiq for the Hadrakin who has used the Souk as a resource and recruitment center. She’s even sold some incriminating pieces, which Ozdemur has carefully kept as insurance. 5. From time to time bravos travel into the U’du area, looking for easy marks to taunt and injure. In recent weeks some have returned sickened, and a few have even perished from an unknown malady. Doctors sent into the U’du neighborhood have found no sign of this disease there. The son of Ashur-dan Ankhuset lies dying and his father has turned to less savory methods to find a cure. So far the source, the Deathland Scavengers, have kept quiet. Jaffar Farzin, a scavenger leader, found an artifact he has used to sicken those who offend him. 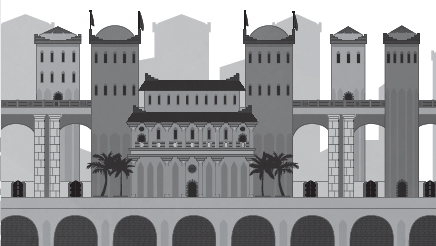 While this began as a means of gaining justice for the downtrodden, Jaffar now has bigger plans. 6. Iruvians take astrology seriously as each star represents a demon exiled from the world. Though gone they still exert influence. The hours of the night are named after the most prominent constellations. Carefully trained astrologers are consulted before major decisions by the military and the nobility. In the last year, however, a new astrologer has operatied out of U’da. Armaiti of Dastani has developed an entirely new schema and set of constellations. She believes these readings reflect a new order coming to the world. Armaiti’s following has grown, with certain nobles secretly travelling have her perform a reading. Argamênos the Seer, master of astrology in the Vaasu, wants her condemned formally at the very least and has begun to make moves against her.